Hello everyone, I received some goodies today from MFT, and I could not wait to use them!!! 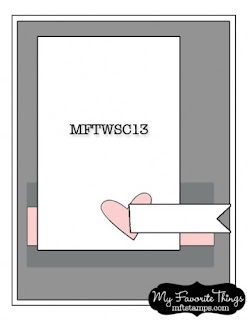 This card I made for the Wednesday stamp club, using the sketch above - MFTWSC13. One of the goodies I received and could not wait to open was out on a limb from the pure innocence collection. This little girl so so adorable, I cut her out and paper pieced her dress then added pearls across her chest. I used copic markers for the rest of her. This lovely flower is from Verve stamps, I received this for free just for placing an order, how fun is that!!! The designer paper is from the paper studio. Some pretty lace, a pink brad and some stitching complete my card. I can't wait to use this stamp set again. You girls have a fantastic day!! Thanks for looking!! I feel a little lonely with only 3 followers, would you follow me please? Thanks, I would appreciate it!!! Brilliant use of pearls, great colours and fun stitching too!! !